Pentair Floor heating cable kit is suitable for the 12 sq.ft area to provide floor heat in the desired areas of the room. It includes 2-coductor 16 - 18-AWG 47-ft cable. Cable has power rating of 146-Watts, voltage rating of 120-Volts and current rating of 1.22-Amps. The included cable features tin-plated copper conductor and PVC jacket. 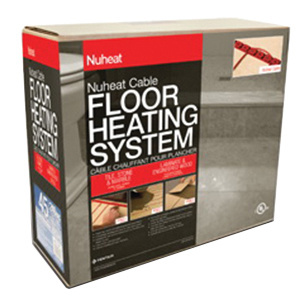 Floor heating cable kit is cULus listed and CSA certified.